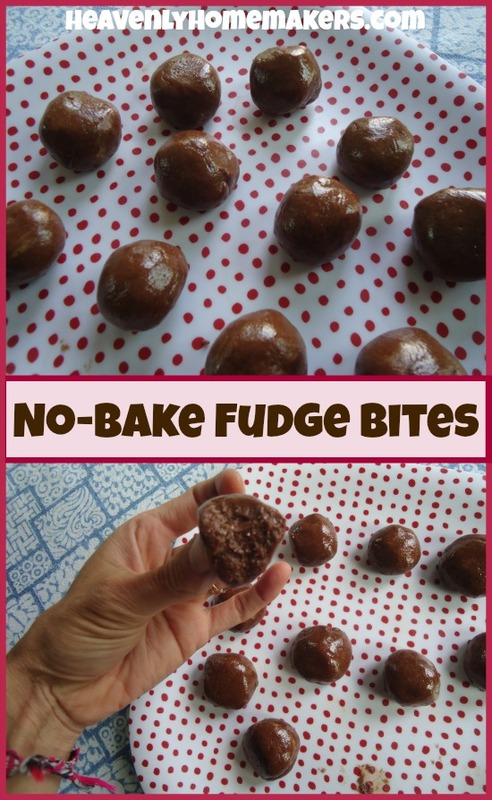 Happiness is found in No-Bake Chocolate Fudge Bites! No wait! Come baaaaaaack! Do you eat apples? Strawberries? Chicken? Carrots? Then sometimes you eat gluten and dairy free. Right? Because that’s what those foods are, without even having to try. There are soooo many foods that are naturally gluten and/or dairy free because God made a big variety of food to provide nourishment and balance. I wanted to put “GF” and “DF” in the title of this recipe so that the “GF” and “DF” people would know they could join this party. Everyone wins. Especially because this recipe involves chocolate. Amen and amen. So gather around all you gluten free and dairy free and I can eat anything people. There are fudge bites to be had! These are cousins to No-Bake Snickerdoodle Bites (which are also GF and DF). Both of these snacks are awesome to have in the fridge for a quick pick-me-up. They were too sweet for me but my boys wished they were sweeter. Add or subtract that 1/4 cup honey amount as you wish. These tasted a thousand times better after they had been in the fridge an entire day. I don’t know why. Eat them right away if you wish, but chilling these in the fridge for over 24 hours makes these much fudgy-er and tastier. We must have been thinking along the same line without even knowing it! I concocted similar to these 2 days ago but instead of coconut flour I used chia seeds ground to a coarse flour in my blender. And did you know you can sneak all kinds of good stuff in like slippery elm powder for that child having ”an issue”? No, that child didn`t know it either! These are delicious! Or so my family told me. I’m waiting to have mine with iced coffee in a little while. Thanks for a quick, easy, and healthy treat. Just a note, if you reduce the honey the balls will be a little drier. I just used my hands to mix them completely and it worked out well. These look so yummy Laura! Just curious if you know how many calories these are? I love making these, and my family can never get enough of them! Great recipe!